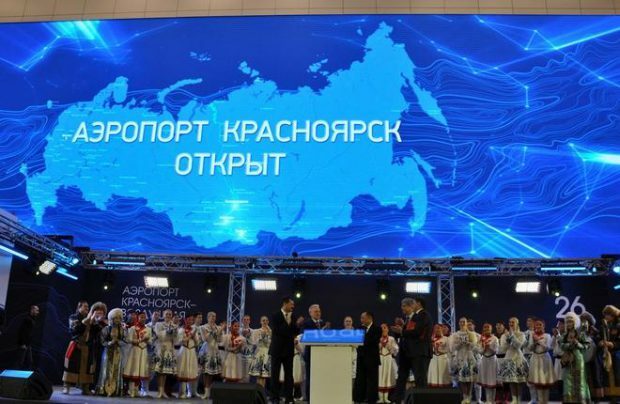 A new passenger terminal has been inaugurated at Krasnoyarsk airport (Yemelyanovo) in Russia’s Siberia. The airport authorities report that the facility started serving domestic flights on December 27. Once the passport control facilities become operational in Q3 2018, the international flights will also be transferred to the new terminal as well. The new building, with a total floor area of 58,000 square meters, can service between 2.5 and 5 million passengers per year. Krasnoyarsk expects the terminal to attract more airlines and help the airport launch new routes. Next year’s passenger traffic is projected at 2.4 million. Krasnoyarsk (KJA) is looking to become the largest regional air hub before long. Сonstruction of the new terminal began in late 2015. The facility is equipped with six jetways and an automated baggage processing system. The project required some 6 billion rubles ($77.6 million) in investment. The old terminal will temporarily serve as a backup capacity, but should be reconfigured into a hall for official delegations in 2018. Seeing as international tourism and cargo traffic is expected to pick up in the years to come, the areas adjacent to the airport are planned to be used for a variety of purposes, including for logistic needs. Krasnoyarsk has demonstrated sustained traffic growth dynamics since the beginning of the year. As of late November, the overall figure for the year had exceeded the 2016 results by 26% year-on-year. The airport welcomed its two-millionth passenger in mid-November, and is planning to have served 2.3 million in 2017. In H1 2017, Krasnoyarsk’s traffic grew 34% year-on-year to 1 million passengers. International traffic outpaced that on domestic routes at 58% against 29%. The growth was partly due to an increase in the number of transit passengers. Krasnoyarsk currently serves scheduled and charter flights operated by 23 Russian and international carriers. According to data available to Russian Aviation Insider, Krasnoyarsk ranked Russia’s 15th airport by traffic in 2015 and 2016 with 1.789 million and 1.769 million passengers respectively, having slid down from 10th position in 2012 (with 1.874 million) to 12th in 2013 (2.044 million) and 13th in 2014 (2.045 million).